RG-59 Five Shot .380 Blank Revolver (Silver) | New Website! Trigger Pull: The trigger pull on the RG-88 and RG-59 in single action is very light with the RG-59 having virtually no take up at all while the RG-88 has some take up but then a noticeable and predictable release point. Both guns have medium to heavy yet smooth double action triggers. Build Quality: The overall build quality for the ROHM RG-88 and RG-59 blank guns is excellent, being German made they are built to last and the fit and finish is very good. There are steel parts where they need to be like in the barrel, pins, screws and reinforcing parts, the rest of the gun is generally made out of a zinc metal with only the grips being plastic. Realism: The ROHM RG-88 and ROHM RG-59 are not exact replicas of any given guns in production as this would make importing them into Canada even more difficult, but they do share similarities with some real guns in production. The RG-88 semi auto looks to be based around a Walther PPK design while the RG-59 has that Smith & Wesson Snub Nosed Revolver look to it. As for looking like and working like real guns, they do this very well, with the exception of the dangerous bullet coming out of the barrel! German made quality, materials fit and finish is all excellent. Almost all metal with some reinforced steel parts. Nice light single action triggers on both guns with double action ability when needed. Both are front firing with semi plugged barrels. Come with flare adaptors and cleaning rods. Seem to be some of the only blank guns we can get here in Canada right now. Not actual exact replicas of any specific guns in production. 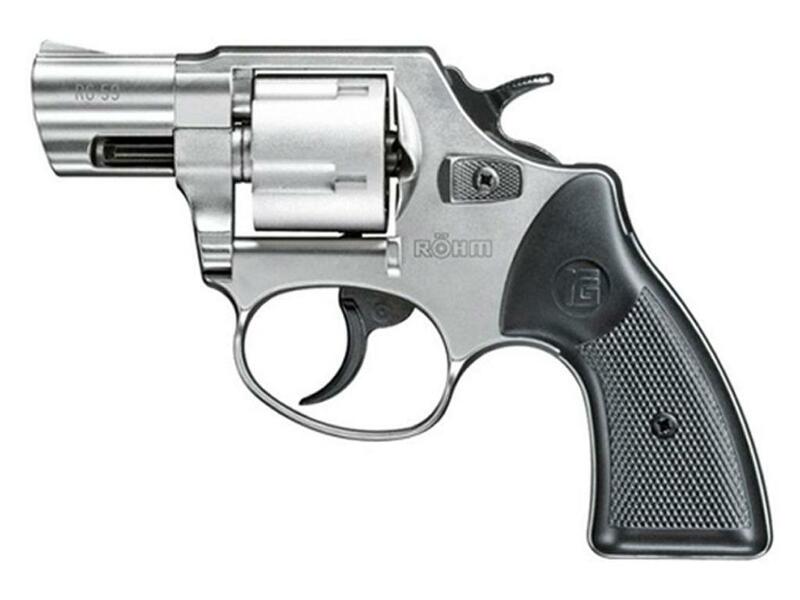 The RG-59 only works with the .380 crimped, 9mm P.A.K. blanks are a bit too long. Comments: As with pretty much all blank guns, they are mostly for show so it all comes down to how do they look and do they go bang when they are supposed to! In both cases they get top marks. Both the RG-88 semi auto and RG-59 revolver feel solid and the mechanical parts are tight and smooth giving a confident feeling when holding them. I like the larger caliber blanks over the .22 crimped blanks as they have a bigger bang but they will set you back in the cost department a bit more as the price for 9mm P.A.K. and .380 blanks will be a lot more than .22 crimped so keep this in mind when choosing a blank gun. If you're looking for a well-made and dependable blank pistol then you really cannot go wrong with any of the ROHM blank guns. http://www.ReplicaAirguns.com - ROHM RG-88 and RG-59 Blank Pistol Full Review. In this video review, I take a look at the ROHM RG-88 Semi Auto 9mm P.A.K. Pistol and the ROHM RG-59 .380 Crimped blank revolver made by ROHM in Germany. I talk about many of the features and benefits of these very well made compact blank shooters. I also take a few shots with each blank pistol and record the video results using both HD and slow motion cameras. As with pretty much all blank guns, they are mostly for show so it all comes down to how do they look and do they go bang when they are supposed to! In both cases they get top marks. Both the RG-88 semi auto and RG-59 revolver feel solid and the mechanical parts are tight and smooth giving a confident feeling when holding them. I like the larger caliber blanks over the .22 crimped blanks as they have a bigger bang but they will set you back in the cost department a bit more as the price for 9mm P.A.K. and .380 blanks will be a lot more than .22 crimped so keep this in mind when choosing a blank gun. If you're looking for a well made and dependable blank pistol then you really can not go wrong with any of the ROHM blank guns we sell in the Canada Replica Airguns Store.